So if you’ve been following my blog at all then you know that I love sample boxes- which are subscription based programs where you pay a set amount of money to receive a box of samples monthly. The last time I mentioned these boxes was when I posted my review of my Julep Maven box- which I loved. And today I’m writing about them because I just received the Blissmo Box Fitness Box in the mail. The box was packed nicely, and had a cute opening note with a description of included products, companies, and prices. 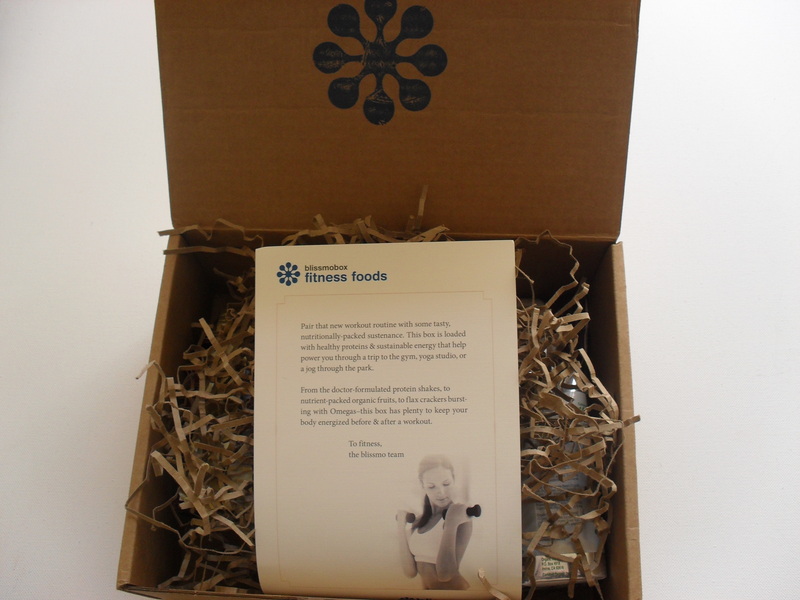 This box was a Fitness Box,so naturally a lot of the products in here were healthy or natural. 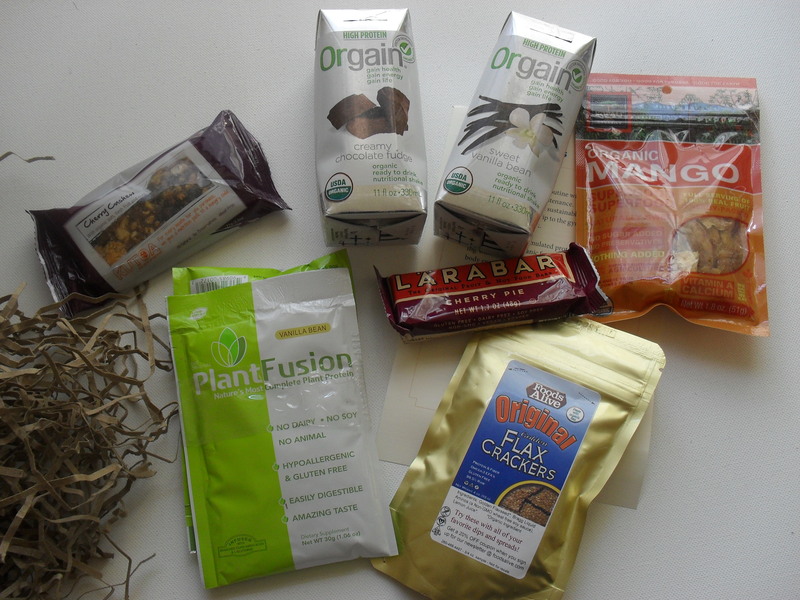 I received 2 Orgain Nutritional Shakes (one in Chocolate and one in Vanilla), a Foods Alive Original Flax Crackers, Cherry Pie Lara Bar, Kopali Organics Organic Dried Mango, Plant Fusion Plant Protein Drink Mix in Vanilla Bean and Chocolate, and a Cherry Cashew Kutoa Bar. Now I love dried fruit, in fact I regularly buy dried mango’s, and orange scented cranberries from Trader Joe’s, so I was excited to try Kopali Organics Dried Mango. Unfortunately I wasn’t too thrilled with the dry Mango. I found it rather tasteless- which is too bad because their company sounds amazing. Kopali is an environmentally sustainable brand that promotes small sustainable farmers from Punta Mona in Costa Rica. Luckily, they also provide other treats like chocolate covered bananas- which I’ll be sure to try in the future. The Kutoa Bar was really good, it had a good mix of fruit and grain. I probably will give the flax crackers to my mom though, because, well, I’m not big on flax. The Lara Bar was really good, surprisingly enough it actually tasted amazingly like cherry pie- which is not something you’d expect from a “health” bar. All in all, while I enjoyed getting my box, at $19 a month plus $3 shipping I wouldn’t get it again. I feel like it was a bit too pricey for the products I received. This might be due to the fact that I’m not a HUGE consumer of fitness products (not that I don’t enjoy a good health bar or shake every now and then). However, I still plan on trying Blissmo’s beauty box- which if you stay tuned I’ll be sure to post here! So are you a health nut? Are you planning to try out Blissmo Box? Let me know in the comments section below! Thanks for commenting! Great site- I just added it to my blogroll :) Let me know what you think if and when you sign up!